Explore reasons why you may want to hide slide titles, and learn two ways to hide them. This is a much better option than deleting slide titles! Slide titles are very important. First of all, they identify a slide. Secondly, they provide structure to your presentation, because anyone who uses PowerPoint’s Outline view will not be happy to see slides without titles, as shown in Figure 1, below. Look for the highlighted red areas–these are devoid of any titles. You have a chart of a picture that takes the entire slide space. So you really cannot add a visible title. You have a single chart on the slide that already has a chart title. You have four charts on the slide that have individual chart titles. An extra slide title needlessly takes significant slide real estate. Your slide has a full-screen video. So we looked at scenarios where some users tend to delete slide titles. Other users who are savvier may tend to choose the Blank slide layout since that’s the only slide layout without a Title placeholder. But those same users will evolve after a few weeks, months, or years and come back to say that they do need slide titles after all, but they don’t need them to be visible. In other words, they need hidden slide titles. This is important if you have large slide decks, and the only search term in the slide is the title. This is legally implemented in many companies and organizations now. Screen readers need a title to read aloud. When you link to other slides in the same presentation or even another presentation, you can choose to link to a particular slide in the middle of a presentation, and the Insert Hyperlink dialog box shows you all the titles (see Figure 2). If you chose not to have a slide title, you’ll have a difficult time in choosing the right slide you want to link to. Troubleshooting: Did you know that some versions of PowerPoint (not the newest ones) will cause your links to fail if the Slide Title has a comma? In case you see any such behavior, PowerPoint MVP Steve Rindsberg has a VBA-based resolution on his PowerPoint FAQ site: Convert Commas in Slide Titles to a “Safe” Character to Avoid Hyperlink Problems. When you create custom shows, the Define Custom Show dialog box shows no slide thumbnails, as shown in Figure 3. All you see is slide titles. If you chose not to have slide titles, you would have a tough time deciding which slides need to be part of your custom show. You may use a SharePoint slide library or a third-party slide management service such as SlideSource or Shufflrr. These tools like slide titles. You may export your deck to HTML5, an LMS, SCORM, or any industry standard that needs each slide to possess a title. What if you want to jump to a particular slide while delivering your presentation? You can quickly bring up the right-click menu, and choose the Go to Slide option, shown in Figure 4. 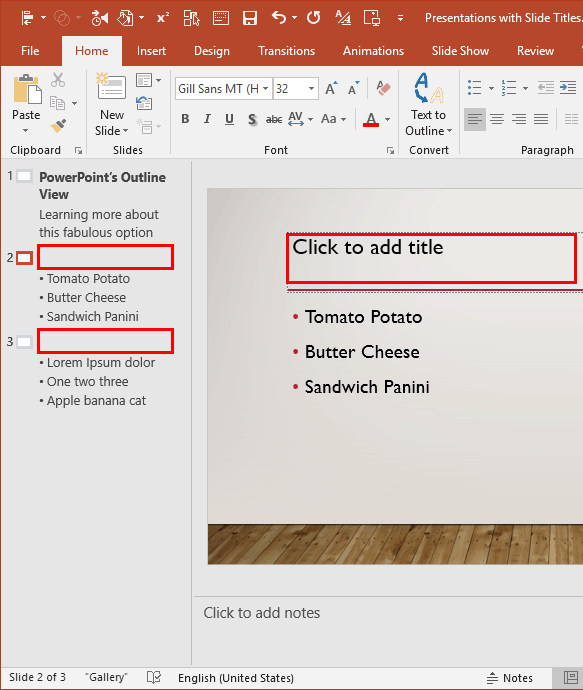 This option no longer works in PowerPoint 2016, which replaces this option with the See All Slides option, that shows thumbnails rather than Slide Titles. The PowerPoint Zoom feature in Office 365 versions of PowerPoint lets you auto-create and name sections, based on the Slide Titles, as can be seen highlighted in red within Figure 5, below. So clearly, you are going to lose so much, if you did not use proper Slide Titles that existed in a Title placeholder. No, none of these options would work if you inserted a Text Box and used that as a Title. See our Text Placeholders vs. Text Boxes page to understand this difference. 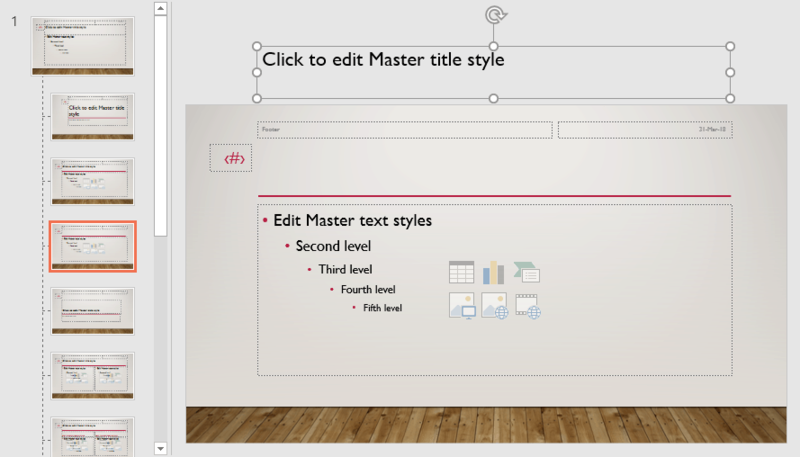 Access the Slide Master and then duplicate the Slide Layouts you use in the presentation. To do so, you can right-click each individual Slide Layout in the left pane, and choose the Duplicate Layout option, as shown in Figure 6, below. It’s a good idea to duplicate all Slide Layouts, even the ones you don’t use. Make sure you rename all duplicated Slide Layouts with descriptive names that make sense (see Figure 7). Now select the Title placeholder on the duplicated and renamed Slide Layout, and push it over the Slide Area. This is easily done by holding the Up Arrow key until the placeholder is no longer in the Slide Area, as can be seen in Figure 8, below. Make similar changes to all duplicated Slide Layouts. Remember to leave the Slide Master alone because there may still be occasions when you need a visible Slide Title! Close the Slide Master view to get back to Normal view, or even Outline view. Now reapply the new Slide Layouts to all slides where you don’t need a visible title. Now you can make sure that all Title placeholders have a real title. 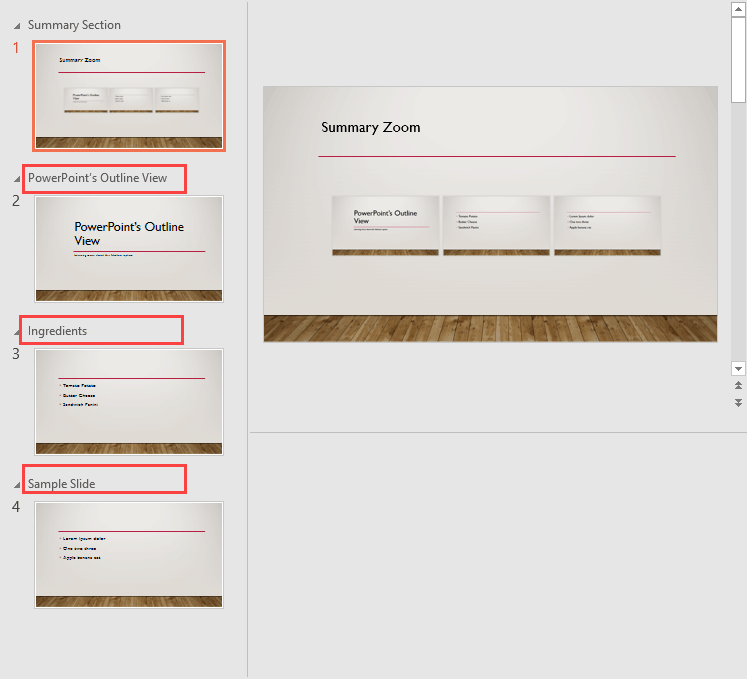 Type in what you need within the Title placeholder, and while this title is not visible on the slide itself, it still shows up in the Outline pane, providing you with all benefits of a structured presentation (see Figure 9). Access the slide, for which you want to hide the Slide Title. Also, bring up the Selection task pane. Now locate the “Eye” icon for the slide title in the Selection pane, and click once to hide the Slide Title. You will notice that hiding the Slide Title this way does not prevent it from showing in the Outline pane, as can be seen in Figure 10, below. Repeat this process for all slides where you need to hide titles. While the Selection Pane process works best to hide a few slide titles, the Duplicating Slide Layouts method we explored earlier works best for more involved workflows. I wish to thank Roger Haight from Microsoft for motivating me to write this post. Also, thanks to my fellow MVPs Dave Paradi, Echo Swinford, Ellen Finkelstein, Nolan Haims, and Steve Rindsberg (listed alphabetically) for providing ideas that made this post better.